Police-public clashes have once again occupied centre stage in the Maldives. Over 100 people are believed to have been arrested in the ‘direct action’ protests organised by the opposition Maldivian Democratic Party (MDP) since 8 July. Several reports of police brutality and excesses have once again come to the fore. The police authorities allege that the ongoing protests are not peaceful gatherings as many demonstrators attacked policemen and carried out other criminal offences too. MDP meanwhile maintains that the protests themselves are “largely peaceful” and that the police are carrying out discriminatory attacks against its MPs, journalists and harassing and intimidating the protestors. Whether the police exercised their discretion to use force appropriately and in due consideration with the constitutionally-guaranteed right to assemble needs to be seen against the existing laws and procedures regarding peaceful assembly in the country. e. However, this is in contradiction to the domestic “regulations on assembly” which were drafted in April 2006, and later ratified under the General Regulations Act 2008. 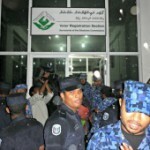 The regulations required three organisers of public assemblies to submit a written form 14 days prior to the gathering to the Maldives police. Only in April 2012 did the High Court struck down this requirement (among others) as being unconstitutional. The Court also struck down the police authority to deny permission, upholding thereby the principle that the police role is simply to facilitate peaceful assembly. Despite the frequency of public protests particularly since the democratic transition of the country in October 2008, it is surprising that the government has so far not amended the regulations in tune with the constitutional safeguards. The continuing discrepancy between the two suggests that police powers during public protests remain ambiguous, and that the constitutional safeguards against restriction of the right (Article 32) as well as protection of right to life (Article 21) and prohibition of torture (Article 54) are unlikely to be reflected in their behaviour. Against this, the police are free to use their discretion on the amount of force necessary in such situations. Their discretion has been found to be excessive in the past. 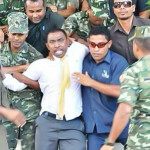 For instance, the Human Rights Commission of the Maldives’s (HRCM) investigation into the police action in controlling the MDP protests on 8 February 2012 was found to be excessive and unnecessary. The HRCM noted that the level of threat posed by the protestors was disproportionate to the force used under Article 14 of the Police Act according to which police may use amount of force necessary to ensure compliance of its lawful orders. It was also noted that the police did not follow properly the protocol as laid down in Regulation on Use of Force and Firearms. Against the requirement, protestors were not given sufficient warning before force and weapons were used to disperse the crowd. All this suggests an urgent need for domestic legislation on peaceful assemblies, one that can strike a balance between protecting individual rights and ensuring public safety. Such a legislation must provide a clear definition of the term peaceful assembly, the kinds of public gatherings that are covered under peaceful assembly, procedure for conducting/organising a peaceful assembly, rights and duties of organizers of such public events, rights and duties of participants of a public assembly, duties of the police including bases on which the police might disrupt or terminate a public assembly and liability in case of any violations of the law. Such a legislation should be governed by three key principles, as enunciated in the OSCE Guidelines on Freedom of Peaceful Assembly and endorsed by the Special Rapporteur on the Rights to Freedom of Peaceful Assembly and of Association, Maina Kiai in his report (21 May 2012), considered as best practice vis-à-vis regulation of public assembly – presumption in favour of holding assemblies, state’s duty to protect peaceful assemblies, and proportionality. Together, these impose a positive duty on the state to put in place adequate mechanisms and procedures to ensure that this freedom is enjoyed in practice. This means that any restrictions placed in the interest of public safety must not impair the essence of the right. In this regard, best practice is considered to be one that discourages seeking prior authorisation for holding a gathering, and one that avoids blanket time and location prohibitions, for instance. This also entails a duty on the state to train law enforcement officials appropriately in policing public assembly with an emphasis on protection of human rights. The Special Rapporteur notes that the pretext of public security cannot be invoked to violate the right to life, and that any resort to physical means must be rational and proportional. Crucially, it is the responsibility of the national authorities to support any claim of proportionality by relevant facts and not merely suspicion or presumptions. Lastly, an important best practice emerging in the field of public assembly is allowing human rights defenders to monitor public assemblies. For instance, the London Metropolitan Police invited Liberty, an independent human rights organisation, to act as independent observers while policing a Trades Union Congress march in London in 2010. Such monitoring may itself deter human rights violations, and crucially, make it easier to establish facts amidst allegations and counter-allegations, as is currently underway in the Maldives. This further places an obligation on the state to undertake capacity building activities for the benefit of NGOs and human rights defenders to monitor assemblies. The right to freedom of assembly is an essential component of democracy that facilitates political mobilization and participation. States have an obligation towards creating an environment conducive for the exercise and enjoyment of this right. A domestic legislation incorporating clear definitions and best standards is the first step towards fulfilling that obligation, and an urgent need in the Maldives frequently disrupted by public protests. The right to protest is a basic human democratic right. We agree! Why does there seem to be such a disconnect between the CW Sec General and the CW Human Rights Initiative. Do they ever read each others reports? The right to protest peacefully, is a basic human right. So are equal rights, religious freedom, thoughts, etc. All from universal declaration of human rights. Maldives has signed it. YET, we do not adhere to it. Islam overrides it. Why? It's easier for the controllers to manage public. Rather than think and work hard to address the social issues, public welfare, general well being, equality, they slide down the religion cocoon, saying women deserve less than men, slavery, beards, penguin dresses, 4wives, etc. while the 4 wives carrot would salivate every red blooded male, the whole concept of religion was formed around to satisfy male ego and nothing else. It once maintained social harmony, in Arabia, in the 6th century. The strategy fell apart a few years later, and has never worked since. In fact where ever Islam had sown the seeds, there has been war ever since. Name one islamic country, without war for ages? And they you claim, a divine guidance in Islam? At best you can argue, it happens in other religions. But, if Islam had a hand of God, it should be perfect, like the Sun, Moon, Stars, Humanity... Right? Thank you for the article. It's very timely and useful. Maldivian legal minds don't spend much time explaining things to us lay people.. It's a pity the author didn't discuss the Freedom of Assembly Bill currently in Majlis. A comparative analysis of it with the Guidelines mentioned would be really good. tell me a country where there is not crime ? Ali Saleem seem to be very anti muslim and racist. The violence had nothing to do with the Islam and it is to do with the people. Are you saying that first and second world war is also was by Muslims . No matter what you and your cronies believe , Maldives will remind as Islamic state. Whole problem is our former president who is implanted by westerners do not know what he signs and he signs anything that is presented to him and doe not know how to negotiate things with the counter parts. If you have seen Anni " famous Movie" Island President , Anni told the news reporter that " i signed the paper which was given to me and never checked what was written there " this is what he answered to the journalist when he was asked when Anni claimed that he did not know that it was going to be a movie . The guy is a big lier and he never able to speak the truth at all. "The violence had nothing to do with the Islam and it is to do with the people." Really? God supposedly created people. People are hacking each other since time began. You think thats what God wanted? Are you saying God made a mistake? All of us who wish to live in a free society need to start a conversation on how our police will respond (and in what manner) to public protest. The mark of a quality police is how they do this with a minimum amount of force. For more information and insight, visit my new book and blog, “Arrested Development: A Veteran Police Chief Sounds Off About Protest, Racism, Corruption and the Seven Steps Necessary to Improve Our Nation’s Police.” My blog is at http://improvingpolice.wordpress.com/ where I discuss these and other current police improvement issues. Good luck and may we all experience great policing!